Jackie Maruschak, James McKinney, Jimi Stanton, and Ivette Dumeng in Marty's Shadow. Photo by Jonathan Slaff. BOTTOM LINE: Two thrilling and humane Scandinavian plays in rep, each dealing with deep fears and pangs of loss that are relevant to all. In Marty's Shadow, the story begins in a slightly dilapidated Parisian apartment; sheets of newspaper are plastered all over the walls. The living room windows look out to a public square where a parade has recently taken place. The air is drenched with post-WWII dread, and a sense of something, or someone missing. An unexpected delivery introduces the invisible titular character. A portrait of the late Marty arrives at the family’s doorstep. The portrait is cleverly just an empty frame, making Marty—the brave war hero, the adored son, the golden boy of the family—more of a decorated idea. Between the occupants is that familiar, debilitating dynamic that lurks between a tyrannical matriarch and her son. The domineering mother, Madame Angelica (Jackie Maruschak), micromanages every action of her second son Gabriel (Jimi Stanton), a bookish, fidgety, and nearsighted translator. Marty’s surviving girlfriend Therese (Ivette Dumeng) is also present, and answers, albeit reluctantly, to Madame Angelica’s every beck and call. It is clear that Marty’s shadow has become the invisible force that binds his surviving relations: the strain between mother and son exacerbates to a toxic level when Gabriel’s pursuit of Therese is cruelly sabotaged by Madame Angelica, who brings in Victor (James McKinney)—like Marty a handsome war veteran—to be Marty’s replacement. As the play progresses, an interminable despair suffocates Gabriel until he commits a climactic act of despair. Stanton carries the show and shines with his portrayal of the unloved son with heartbreaking intensity, evoking both pity and repulsion as a more-sympathetic Norman Bates who is nevertheless still despicable. Stanton's chemistry with both Maruschak and Dumeng is nuanced and distinct; both actresses also bring dimension to their respective complex characters. Dagerman based his characters on Viennese-Jewish writer Etta Federn and her sons, Capitaine Jean aka Hanz who died during the war, and Michael, the antihero. The program includes a quote from Stig Dagerman’s initial staging of the play in 1948: "The people die; their shadows linger—they terrify, haunt or kill us. When we look up, we see them projected onto the walls. They only way out is to turn off the light." The shadow, in this case, haunts the lives of all the characters. The loss of a son, or a brother, creates indescribable pathos between mother and son, which causes the ultimate tragedy. It’s unfortunately an all-too-familiar phenomenon, when a memory or looming shadow causes much harm in the living. The other piece playing in repertory is Journey In Light And Shadow. Robert Greer directs Stig Dalager’s enigmatic new play that's quite like an Escher painting, with layers of inception that blur the lines between reality and fiction. The wunderkind playwright directs a pair of actors, his ex-girlfriend and her mother, in a play about their life. The process of rehearsing the scenes within the universe of the play makes it into a sprt of therapeutic exercise. The play opens with actors Susanne (Lauren Smith) and Marion (Carol Carter) in character (as themselves), before the entrance of playwright/director Jacob (Fergus Scully) reveals that it’s a play within another. The actors become each other’s psychopomps through a process of self-discovery and untying the knots of past issues. Multiple parallels between characters are illuminated as the playwright continues to direct the pair of women who play significant roles in his life; he jumps into the scenes himself to facilitate various narratives in the past, present, and eventually the future. 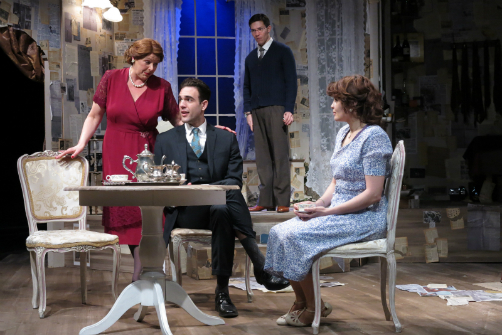 The structure of the play is reminiscent of Tom Stoppard’s The Real Thing or Allan Bennett’s The Habit of Love. However, the transitions between different layers of characters are unclear to the point where it confuses the characters themselves. Of course, this is the point of the play—the playwright becomes submerged in the play of his own life so that he and his actors can all heal from the pain of their own (and their parents') past in order to move on. Carter is surely a highlight of the production. With a pronounced presence as the aging actor, she switches effortlessly between her various (albeit similar) roles with perfect clarity and distinction. However, it’s difficult to follow the entangled threads of each character in the worlds they simultaneously exist in. Although this is the nature of the play itself, the production might land with a more powerful note if these different dimensions were made more distinct. Marty's Shadow is by Stig Dagerman and directed by Whitney Gail Aronson. Journey In Light and Shadow is by Stig Dalager and directed by Robert Greer. Plays adapted by Natalie Menna. Costume Design is by Kathy Robertson. Set Design is by Jen Price Fick. Lighting Design is by Jason Fok. Sound Design is by Andy Evan Cohen. Prop Design is by Shannon White. Stage Managers are T. Michael Culhane (Marty's Shadow) & Lisa Nava (Journey In Light and Shadow). The cast for Marty's Shadow is Ivette Dumeng, Jackie Maruschak, James McKinney, and Jimi Stanton. The cast for Journey In Light and Shadow is Carol Carter, Fergus Sully, and Lauren Smith.